When you guys tell me this website could serve you better, I always do everything I can to meet your needs. This is why Parentville is now equipped with an events calendar – perfect for planning weekends, Wednesdays, and all other days of the week. You can search via dates, locations, and categories (including ages of children). There is one particular category with charity events and occasional categories such as “Easter camps” for example. The calendar shows one-off, ponctual activities, festivals, and workshops. If you hear about any event not included in the calendar, or are hosting one – let me know! I will happily include it (and yes, it is absolutely free). Schools off, jardins d’enfants off, tpg on the holiday schedule. For those of you not going away, I prepared some ideas for the week of 18th February. It includes camps, activities, and day trips. 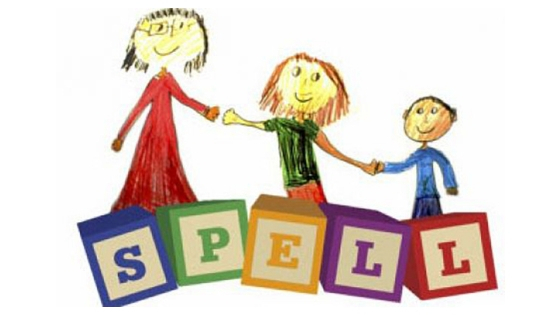 Spell Languages – adventurous language camps! 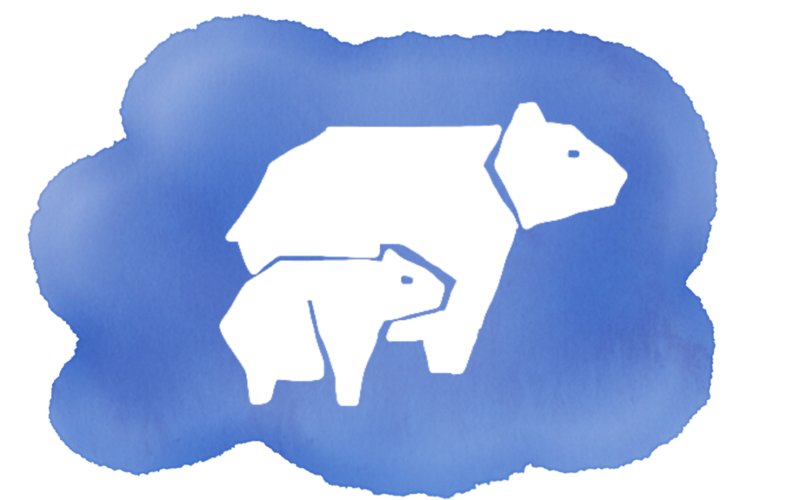 English camp under the themes of Ice Age, Winter Olympics, or Minecraft. Museomix – kids will imagine and create prototypes of what they would love to see and do in a museum. You can read more about this camp here on Parentville, or here on Museomix’s website. Bricks 4 Kidz – a week (or a few days) with Lego. For Rive Droite check here, for Rive Gauche check here. Future Kids – STEM holiday week for kids aged 5 – 12 (different age groups). The best news! To get more girls into STEM, Future Kids offers 50% discount for them! Gymboree – if you’re looking for a camp for a 3 years, you have just found it! 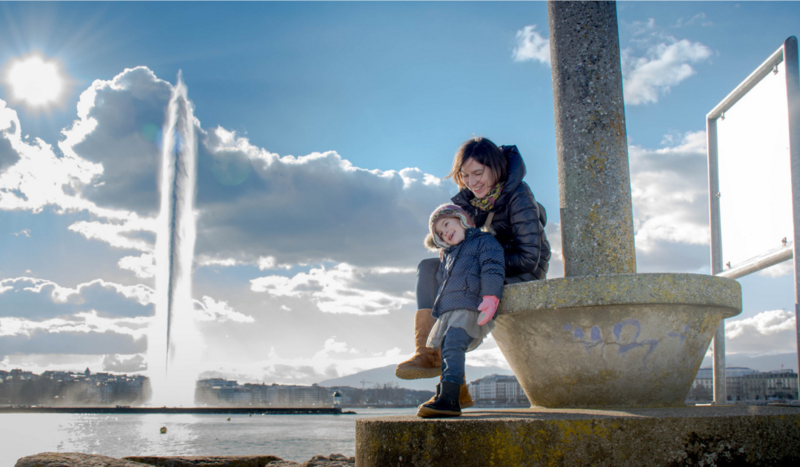 Gymboree Geneva is well known for it’s high quality child care and fun activities over all school holidays! You can enroll for 1 to 5 days. This is a half day camp: from 8h30/9h00 till 12h00. 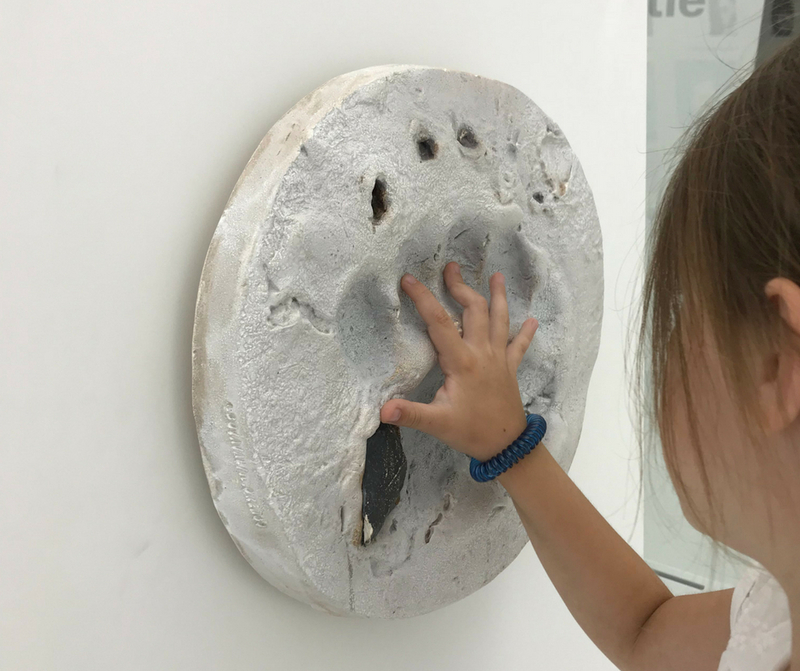 Maison de la Creativité – the best place in Geneva for kids aged 0-6 will be opened every afternoon from 14h30 till 17h30 during the February holidays. On top of dad grandparents who will take care of their grandchildren during the holidays can also come in the mornings of 19th and 21st February (from 9h30 till 12h00). Bibi Café – the right place for every day (closed on Mondays and Tuesdays). On February 20th an activity for kids and accompanying adults to create necklaces together. 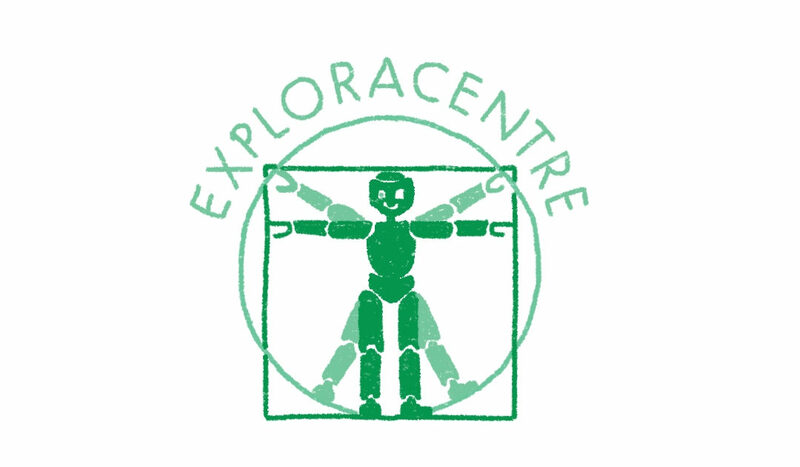 Exploracentre – a vast choice of workshops is waiting for kids as young as 4! Check their website and reserve your place asap! You will soon be able to find more events, workshops, and fun activities in our brand new events calendar. It is not yet perfect, we’re working on the design and functionality as we speak, but it’s there! 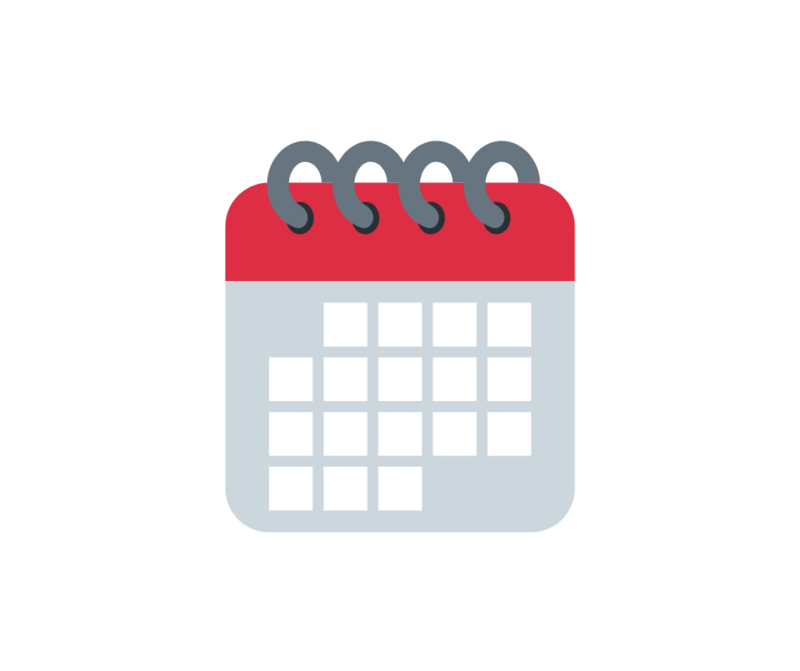 Click the button below to open events in the new window. PS: If you are an organizer of workshops, courses, or events for families and children, and you would like your events to be included in the calendar, please let us know! It’s free! – Winter warm-up places with Papiliorama, and warm pools! – Sledging nearby, including La Givrine that you can get to without a car. Photo credits: Gymboree Geneva. (all pictures in this article). A few weeks ago I was invited with Z to visit a familiar place that we had not been to in a while, a place beloved by us both; Gymboree Geneva. 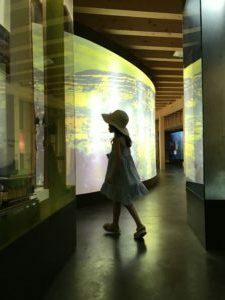 As soon as we entered, the familiar smell of babies and sounds of happiness brought back my memories of joy and exhaustion from the first years of motherhood. Back then, when Z was little, my French was limited by a massive lack of confidence, and I did not know many other local parents, so when a friend told me about a play centre for English-speakers I didn’t think twice. Z was eight months old, and with each passing month I felt more lonely and addicted to my phone (and the mom-friends I chatted to within it). To cut a long story short, Gymboree Geneva ended my misery. I met my best friend in Gymboree, Z met her best friend there as well, and we learnt songs that we still sing today! 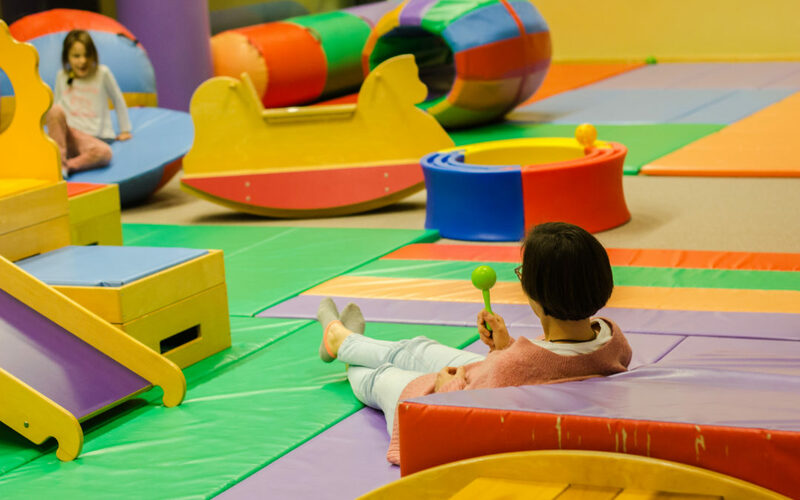 Located in Grand-Saconnex, Gymboree is a large soft-space area with many fun obstacle courses for babies and toddlers. It also offers several types of classes, including sensory, music, art, play&learn, for a multitude of ages, and there is a free COFFEE MACHINE! 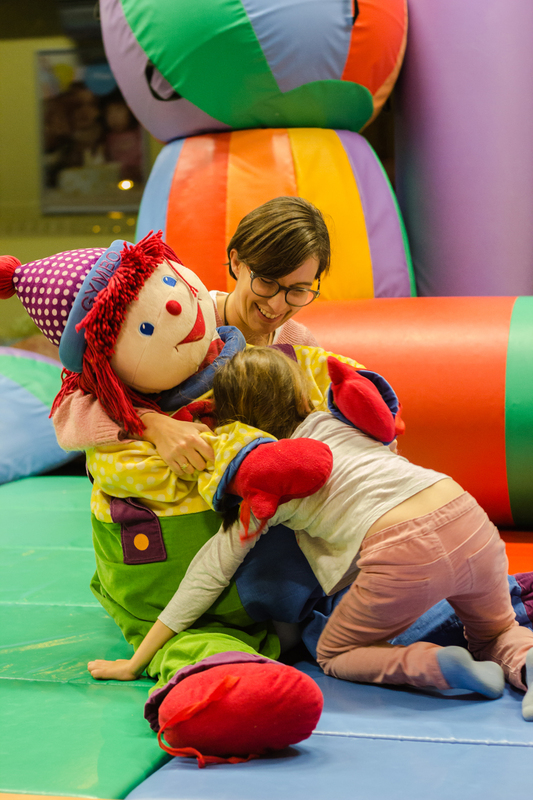 And that is not all – there is also a preschool, the possibility to organise a birthday party within its soft, colourful interior, and countless occasions to hug a giant plush clown called Gymbo. 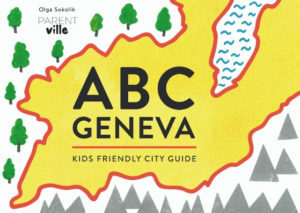 Oh, and my first children’s book “ABC Geneva” is available in the little Gymboree boutique! If, at first, you feel like it sounds a little bit like joining a sect who pray to a colourful clown, don’t worry, you’re probably not the only one (at least I hope I was not the only one!). Sitting in a circle each week with Gymbo sat front and centre, singing songs about him and to him, and then taking turns to kiss him might sound disturbing at first. 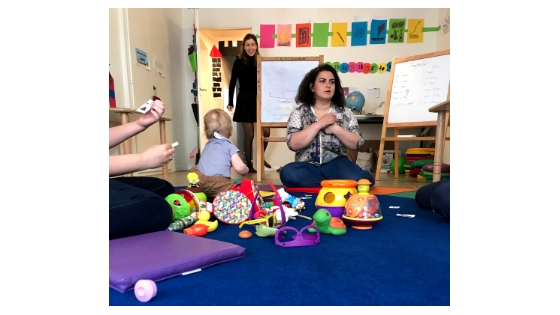 Don’t worry though; it will pass, and soon you will be thankful for meeting Gymbo, his role in making your kid happy, and for a bigger circle of friends who will love to chat about diapers, sleepless nights, and developmental milestones. It’s funny, now that I have written this it does feels even more like a sect, but a pretty damn good one: Gymbo the clown – The Savior of Parents. What I love most about Gymboree is that even if you enrol only for one class per week, you still have access to the play area during the “free-play” hours called “Play Gym” (which is offered 2-3 times a week). This alone is brilliant during wet and cold months, or when you just need your child to let off some energy while you have a well-deserved (and still hot) coffee or tea. I remember times when my new parent-friends and I, after a sleepless night, would take turns to keep an eye on the kids while some others chilled with one eye closed in the corner, fuelled by coffee and biscuits. It became our refuge, almost like Starbucks has done for a teenager eager to get out of the house. Gymboree definitely helped me create my own village (and I am sure we all agree that it takes a village to raise a kid, or us parents go nuts!). It was there that I met women without whom Parentville would never have come to life. It also helped me to speak English with ease, a bonus that we were not aware of, not we did we expect. So, if you have a child or children to care for and are looking for a place to have both a coffee and an enclosed play area for the kids, Gymboree is THE place. There is just one thing left to do: put on your socks. Yes, socks! – Because you can only enter the soft-space with socks on. Learn from my mistake, and make sure you have socks on both feet, preferably the same pair, and without holes. Although Gymboree has thought of that and has some spares readily available for those days when even getting two socks on your own feet seems like a challenge. If you would like to know more about Gymboree or my experience there let me know in the comments, send me an email or even a pigeon will work (just let me know what I need to feed it, and if it, too requires socks). STEM for kids in Geneva? Where to go? Where to enrol? 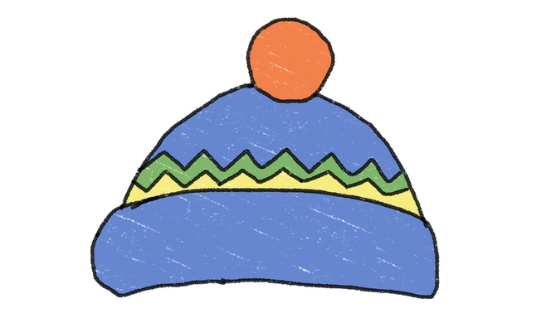 So far on Parentville, we covered theatres, playgroups, dance classes, language course, and even sledging. We talked about museums (here and here). Now is the time for science, technology, engineering, and maths – STEM. Some say STEM is the future (that is unless we drown in the sea of plastic waste). Are there any jobs that don’t require any use of technology, even such a tiny device as a smartphone? This will probably develop further, with professions of the future not even existing just yet. At the same time, we know that kids learn best while playing. Is there any place in Geneva that combines both? 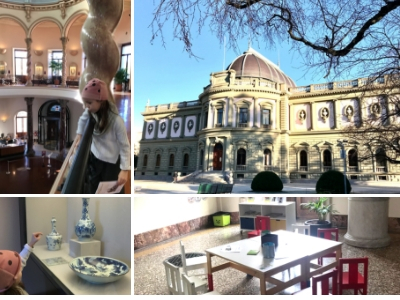 Where in Geneva can kids feed their natural curiosity, where can they acquire STEAM skills and knowledge? In several places! Well, hello!? Aren’t we living in the canton that hosts one of the most important scientific organisations in the world? Do not hesitate to take your kids to the Globe of Science and Innovation, or to the Microcosm exhibition. The exhibitions are not designed with kids in mind, but they are still worth your time! Cern has also created a trail around the LHC (the Large Hadron Collider), recommended for kids aged 8+: the Passport to the Big Bang. For smaller kids “ABC Geneva” explains the goal of this organization in a simple way. 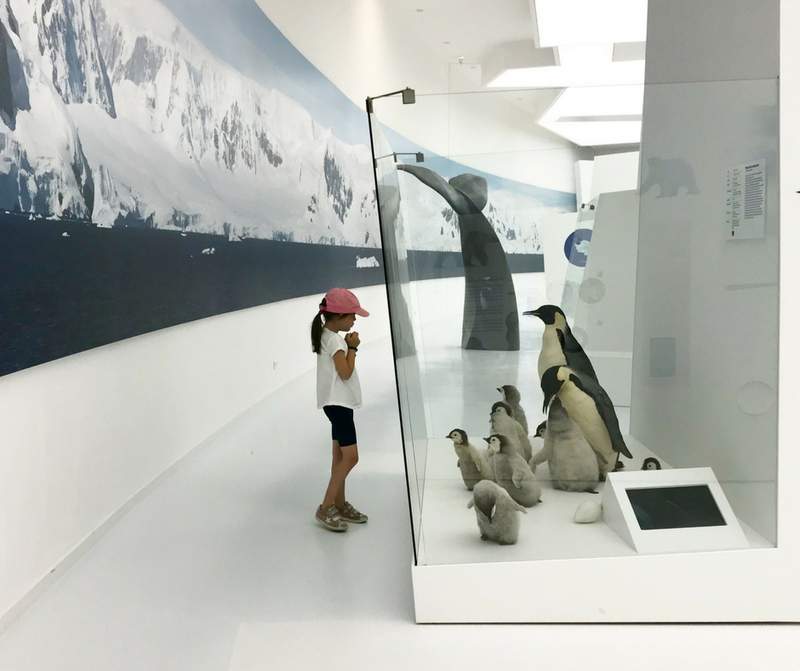 Opened in November 2018, it is the first science centre in the canton explicitly designed for children! You can choose between the interactive exhibition, workshops, birthday parties. Click/tap here to read Parentville’s article about this place. The Science History Museum presents objects and methods scientists have used. A lot of things to manipulate, touch, and look through. Be sure to check their current temporary exhibition, as well as Wednesday’s workshops! For more details visit the Museum’s website. STEM cannot exist without creativity. We usually relate creativity to artists of all sorts, but scientists are one of the most creative creatures as well! Maison de la Créativité invites kids up to age 6 to enjoy many creative activities indoor and outdoor in a wonderful garden. Pencil it in: March 6, 2019! It is the date of the opening of the Bricks 4 Kidz Centre in the Quartier de la Chapelle in Lancy. It will propose many types of lego-based activities, such as after-school on school days, on Wednesdays, and free access on Saturday morning. IT STEP ACADEMY – programming, coding, building animations and games, workshops for parents (on internet security for example), and more. For kids aged 8+. A super cool place in Nations. Visit their website for more details. #parentvillerecommended. 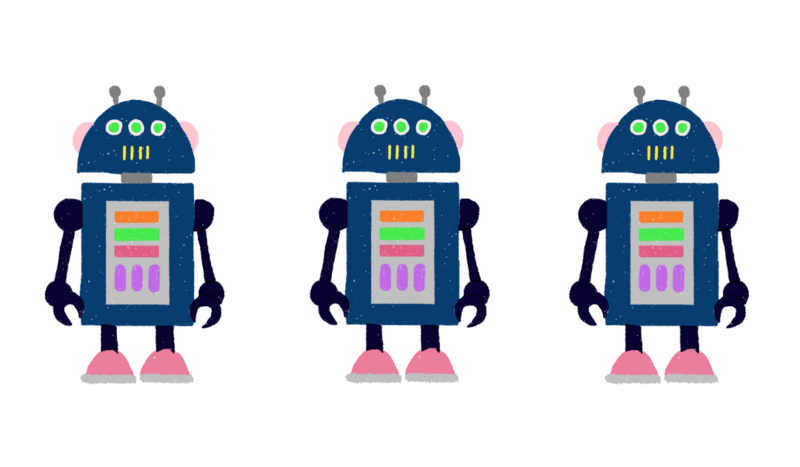 FUTURE KIDS – robotics, electronics, coding, creation of games, Minecraft, and more. They offer weekly courses, camps, birthday parties, and occasional workshops. They offer courses in Rive, Collange-Bellrive, Petit-Lancy, and Servette. Read more about them here. 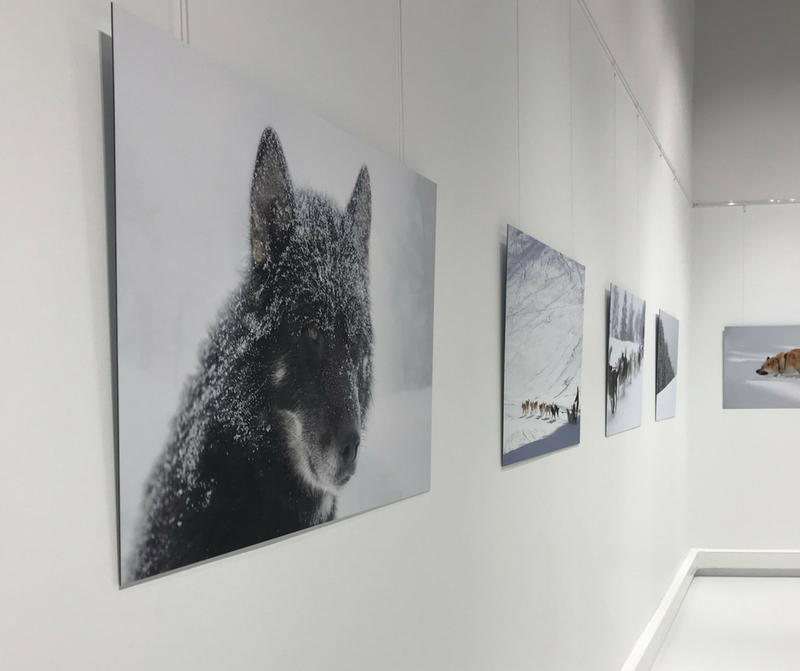 ADDICTLAB – They offer various STEM activities throughout Geneva, and opened a LabSpace in Espace Candide in Ferney Voltaire. You can also ask them to offer animations on birthday parties. Visit their website for more details. KNOCK ON WOOD – working with wood is as much filled with STEM as using Lego, or even more. Though the mission behind this project is different (“to promote manual fabrication, repurposing unwanted furniture or recycle old wood in the Geneva area by giving you the knowledge, space and tools to create your own masterpieces”), I believe building with wood means measurements, planning, geometry, in other words, it is filled with mathematics. More about this brilliant project here. Espace des Innovations, in Lausanne, click to open their website. La Turbine sciences, in Annecy, click here. Aquatis, in Lausanne, visit their website for details. Espaces des Mondes Polaires in the French Jura. Read my article about it here. Maison du Saleve, Parentville’s article about it here. 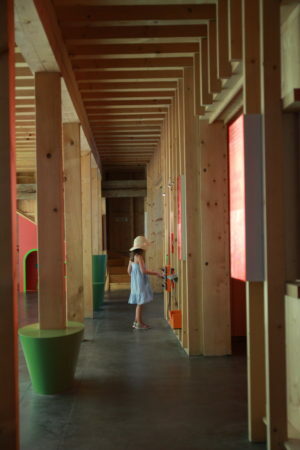 And a bit farther: Explorit Kindercity in Yverdon, that I find absolutely fantastic. I am so excited about what I am going to write that you can expect many typos (as jumping up and down from joy does not go well with using the keyboard). Let me try though! A new (first!) 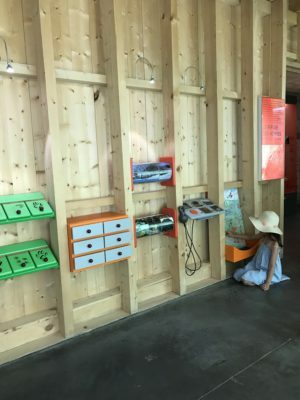 science centre in Geneva for kids has opened! Exploracentre, the first science centre for kids in Geneva is opening its doors on rue des Bains 33 in Geneva! I repeat: EXPLORACENTRE on rue des Bains 33 is opened for visitors! What is the science centre? It is a museum when kids can not only touch everything but also manipulate all the objects to find out how they work. In other words: forbidden not to touch (fr. inderdit de ne pas toucher !). I visited Exploracentre twice already: without Z, and after with her. During my first visit, there was this voice in my head screaming: why nobody had taught me this way at school? Nobody said physics could be fun! I remember learning about centrifugal force, but it is only in Exploracentre that I could see how it works: observe, touch, and then read about it. But Exploracentre is not about the physics only. After all, science is a broad matter. Read on. The centre has two levels. The upper one homes the Circus exposition. There is so much physics in the circus, right? Balancing for example – how do they not fall? And again, why no physics teacher ever thought about using circus to explain these things!? This exposition is not permanent, as Exploracentre wants to show us other science revelations in time. The new expositions will probably start with every new school year. The lower level of Exploracentre has a smaller exposition that will change every three months. Currently: building bridges without any glueing substance, discovering the properties of the ellipse while playing billard, and more. There are also rooms for workshops: a scientific room, and an IT room, as well as a space for, wait for it, birthday parties! Everybody aged 3 or more. Kids, tweens, adults. Science ignorants, and those passionate about it. Anyone who likes to play. Free for kids under the age of 3. Different prices for groups of 3, 4, 5 people. Read about other places promoting STEM activities among children, by clicking on the button below. Old and mysterious from the outside, very modern yet keeping the countryside style inside. 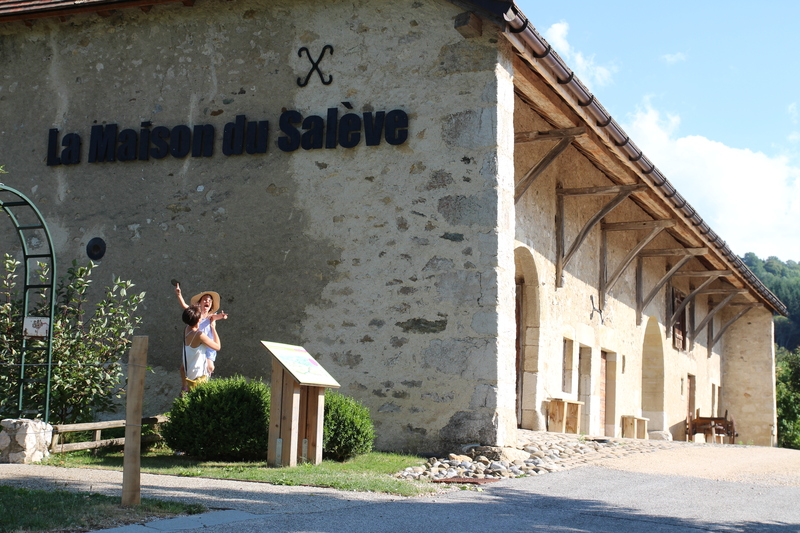 Maison du Salève is absolutely charming, engaging, and has a very wide offer for families. We have passed the road signs leading to Maison du Salève many times. But it hasn’t been until recently that we decided to finally check it out. Don’t be us. Don’t wait. Some museums mistake interactivity for touch screens and other screens. Not here. Maison du Salève nailed the interactivity if the permanent exhibition like a pro! Puzzles, drawers to open, quizzes (one using a screen and buttons to make several people compete), things to touch, and manipulate. 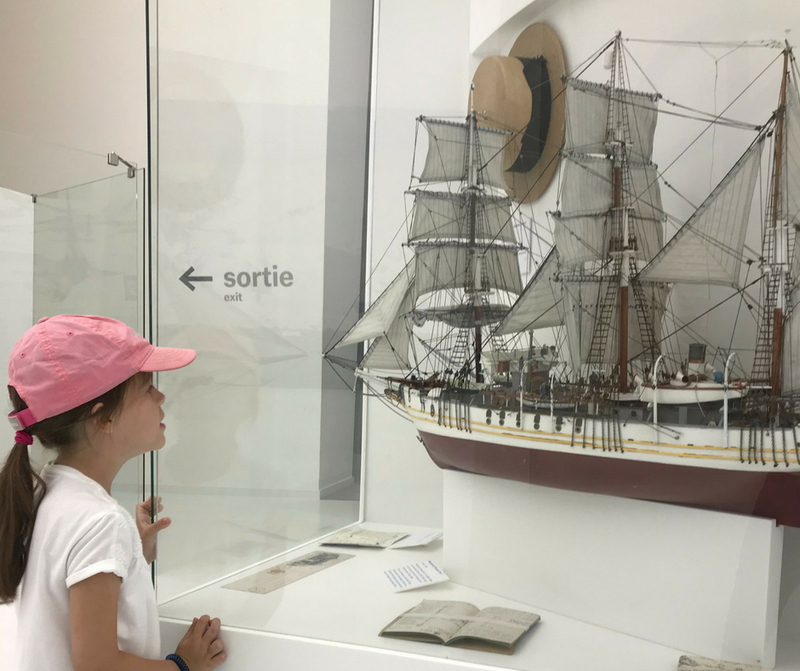 Can an exposition about everything-Salève be interesting and attractive for kids? Let’s see. The first floor exhibition tells a story about Salève. It explains how the rocks we find there help to recreate that story. It covers everything from dinosaurs, plants, animals, caves, to how humans got to live there, and how they created the cable car. The temporary exhibition on the ground floor is about sounds. 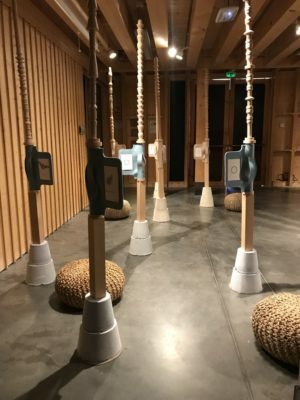 You will receive a smartphone with headphones, enter a very nice wooden room, and scan pictograms to reveal the sounds of different kinds of animals, and not only animals. The app sometimes freezes, and it’s not clear from the start what to do and in which order, but fortunately it does not matter. You can ignore the rules and a simply scan the sounds you want to listen without complicating things too much. 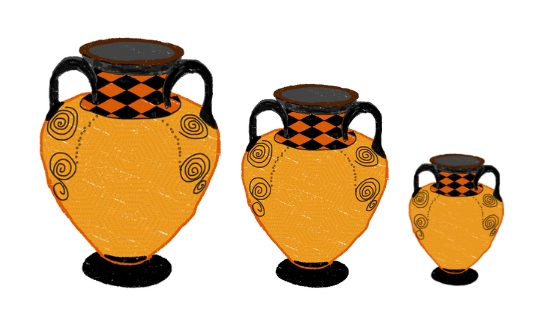 A museum outing with kids is complicated enough after all. 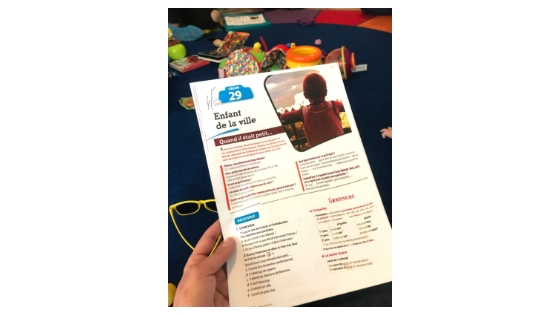 Last but not least, Maison du Salève organizes a lot of activities for kids (small and big). They sometimes take place on the premises or in the garden surrounding the house. Sometimes it’s a walk with fun theme somewhere on Salève. And other times it’s a cable car ride up. Check their schedule for dates and themes. Now, one really last thing. 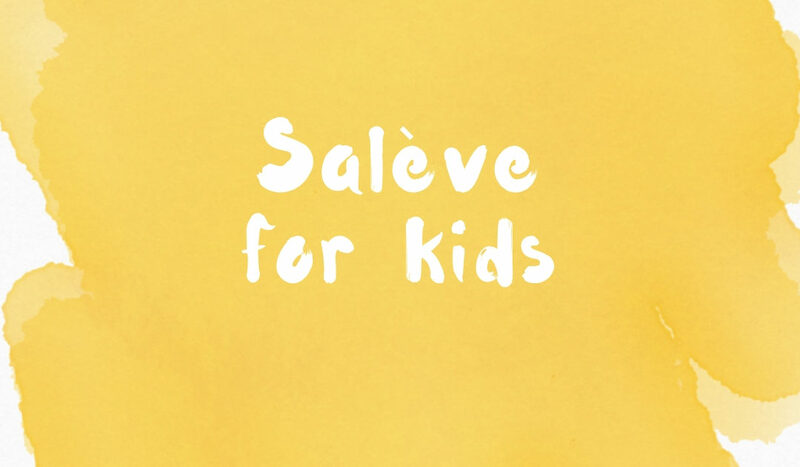 You can organize your kid’s birthday party with Maison du Salève, and from what we heard it’s quite great! 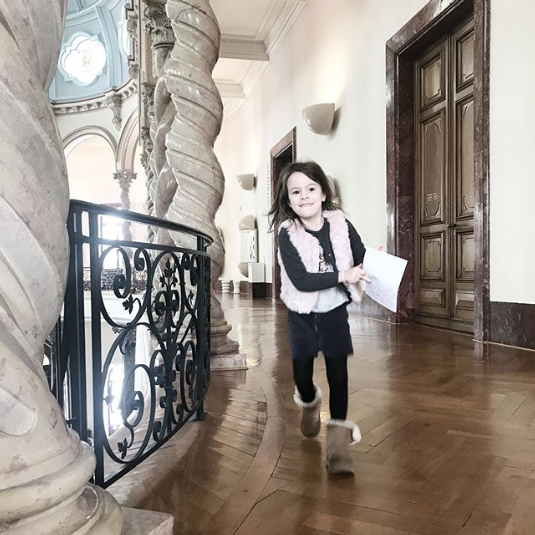 Comparing to everything we know in Geneva and around, we can wholeheartedly place Maison du Salève on the top of the kid-friendly list in the region. Absolutely #parentvillerecommended! If you get hungry after the visit, do not hesitate to visit the B com Brasserie, 15 minutes drive away – kids corner, kids menu, and a modern industrial feel. No restaurant or buvette, water available in the gift-shop. as they lead us to wonderful places. To hear the sound of an ice berg moving, to touch the polar bear’s fur, to ice skate in the middle of the summer. All less than 1h drive from Geneva in the wonderful Espace des Mondes Polaires. Let me take you to the one of the most exotic places on Earth. Where everything is white, where only the toughest survive, a place that has been fascinating explorers and scientist for ages. Ladies and gentlemen: the poles! To get there, you’ll have to conquer the sharp turns on the Jura mountains, and cross the deserted French border. Then, drive through the wilderness and soak in the amazing views, just until you get to Prémanon (Les/Des Rousses region). You have now reached one of the most gorgeous museums in the region: Espace des Mondes Polaires. A museum devoted to all-things-poles. By devoted, I mean so much devoted, they also built an ice skating rink open all year long. The museum is very modern-looking inside, very simple-looking, like the poles themselves. Everything is white or made with glass. It’s white and quiet. When we enter the permanent exhibition, we are surrounded by moving ice bergs and their sounds. Scary for some, fascinating for others. We go farther, to check out the massive tail of a whale in the distance. A stop on the way to learn about ice bergs first: how they are formed, what they are made of, a true ice bergs 101. There are many videos to watch and games to play all around us – they help us find answers to questions emerging in our heads. The animals are amazing. The fox, the bear, the penguins, all the whales, orcas, and other dolphins. Their colors perfectly match their environment. It is mind blowing how they can survive this rough environment. We touch their skins to understand it better. We then move to further to discover the explorers’ trips to the poles. There’s a lot to learn here about Paul-Émile Victor, an explorer from the Jura region, and his fascinating trips. We compare equipment from the past, with the modern one. 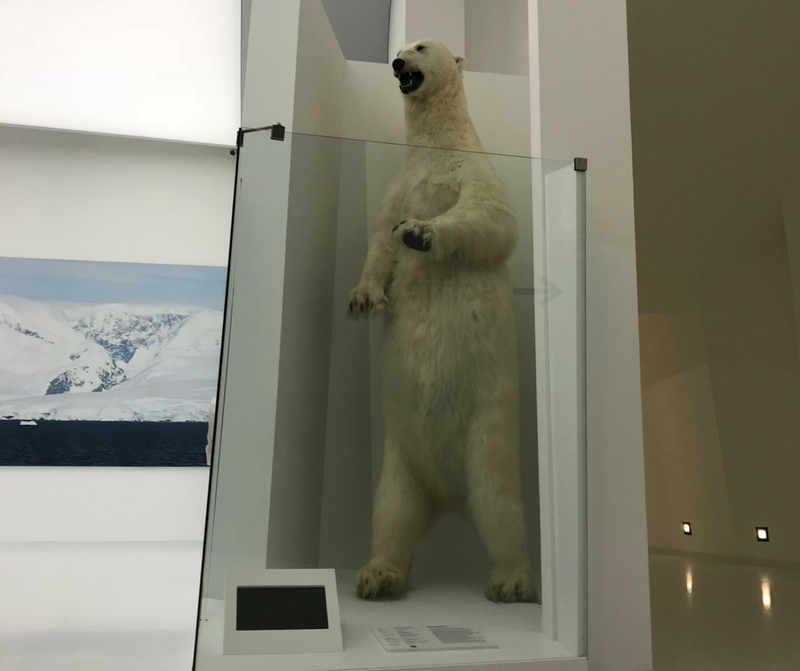 Quick look at the massive polar bear, and we enter a separate room with a temporary exhibition. It inspires us to organize a dog-sled ride in winter. Now, finally run to the other part of the building – to the true reason of our trip. But first: clothes need to change. Short sleeves and shorts won’t do. It is the time for Sweaters, long trousers, professional winter gear, and compulsory: gloves. Music on, here we go! Ice skating in the middle of heatwave, wearing warm sweaters and gloves feels so absurd we can’t not laugh. It feels amazing, so fresh, and so good! 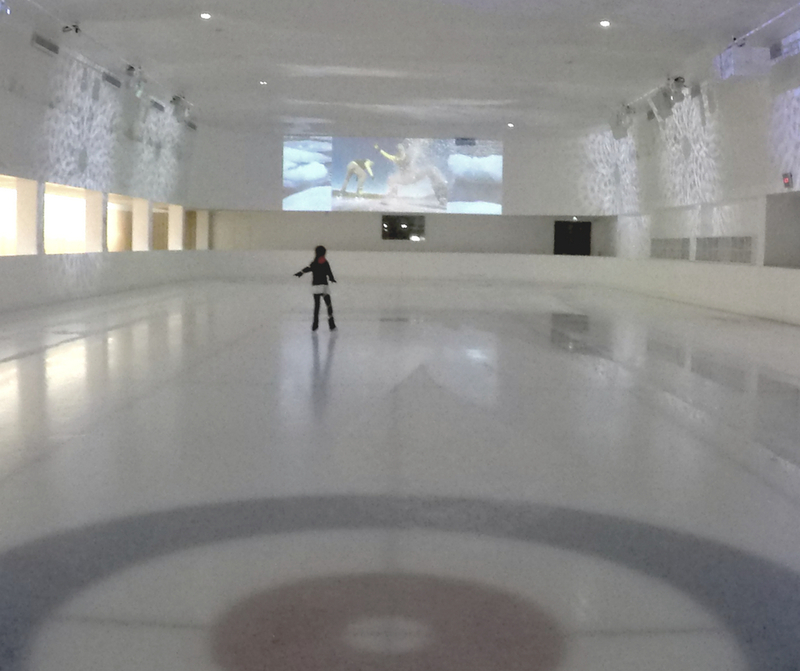 We practice our moves before the ice skating lessons in Meyrin start again together with the school year. Our last stop: the gift-shop. 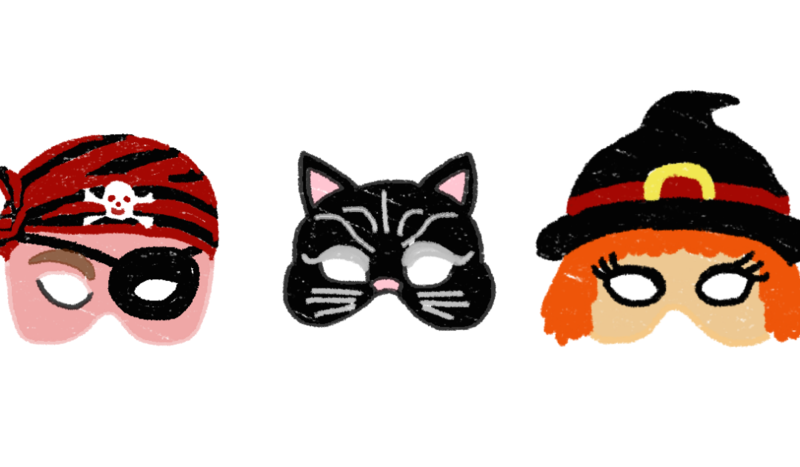 A fury diary is just what we needed! The only thing we didn’t try was the restaurant. It looked and smelled nice though, and it has a view on the rink. Planning this trip in every season is good. In winter, you’ll have more polar feel with the snow covering the jura. In summer, you’ll get a break from the heat and be silly on the rink. It will be a fun day, anyway! 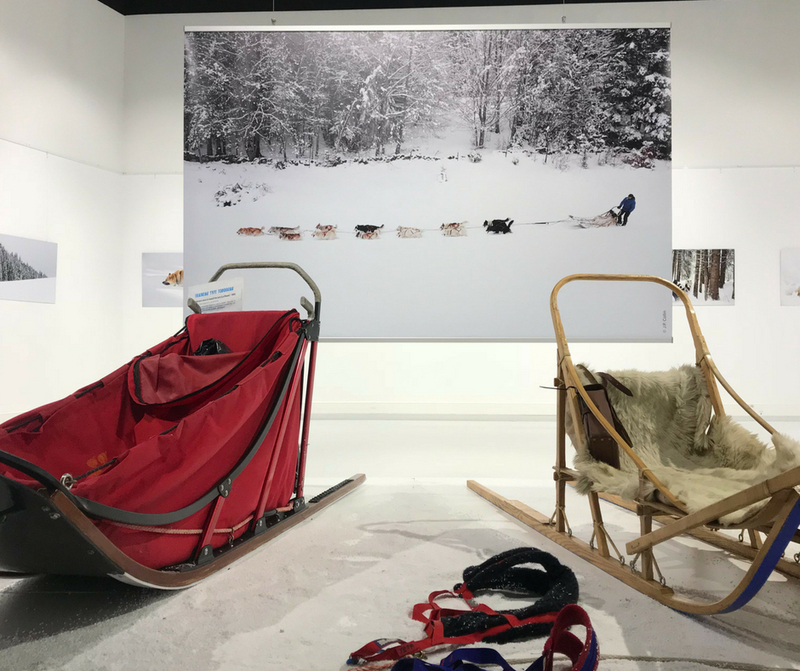 Where to sledge near Geneva? Where to warm up in winter? Where to go for a Sunday brunch?